A potting shed oftentimes represents a significant investment for amateur gardeners, and its cost should, therefore, be justified by what it provides. If you are interested in acquiring such a garden building, there are a few things to keep in mind when making you selection. 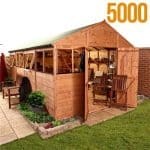 A wide selection of potting sheds is available from retailers both in the United Kingdom and abroad, and each of these structures has its drawbacks and benefits. Probably the first thing you should decide on is whether you want a metal shed, or a wooden one. The question here is how much hassle you are willing to endure for your new building. The trade-off is between heat and maintenance costs. Generally speaking, a wooden potting shed will be warmer than a metal one, as timber is a natural insulator. On the other hand, metal needs less maintenance over time than wood does. 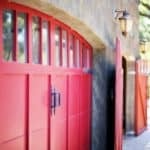 However, this does not mean that metal sheds do not have to be looked out for. One important aspect to keep in mind, after selecting the building materials that best suit your needs, is that you need to have proper lighting inside your new potting shed. The cheapest ones on the market generally tend to not have enough windows, so a lower amount of sunlight will make its way to your plants. If you can pay a little extra, always go for the structure that provides the highest amount of natural light. Insulation is also an important issue to consider. Some retailers prefer to cheat their customers out of their money, by providing potting sheds that are put together using low-quality insulating materials. Quality silicone can get you around this problem, so you should inquire the retailers and manufacturers whose products you are interested in about what type of materials they use for this purpose. 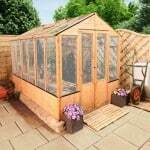 If you decide to go with a wooden potting shed, make sure that you choose one made out of pressure treated wood. This means that the timber has already been treated against rot and weather. It will endure for several years without the need for maintenance. If you have to buy a lower-quality shed, make sure you also purchase the necessary chemical preservatives. These substances need to be applied on all exposed wooden surfaces, both inside and out, every year. 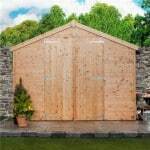 If you take good care of your shed, it will last for a very long time. The type of glass used for the windows is also very important. Toughened glass is your best choice no matter what type of shed you buy, since this material needs to withstand harsh weather and heavy precipitations without giving way. During the winter, a lot of snow and ice can accumulate on the windows, placing a lot of strain on the structural integrity of the shed. Additionally, if toughened glass does break, it will not produce hazards sharp shards. In terms of ventilation, it is important to choose a potting shed option that provides either a built-in fan, or an automatic vent opener. Having the latter installed will significantly boost productivity, and allow you more free time to take care of the plants. The glass on the vent openers should be just as resistant as the one used to construct the immobile windows. If you decide to buy a potting shed kit, find out whether or not your retailer provides assembly and construction support. If so, it could save you a few hours of having to decipher cryptic instructions that usually skip a few steps. On the other hand, if you are technically inclined, or have constructed similar structures in the past, then assembly your own potting shed should not be a problem. 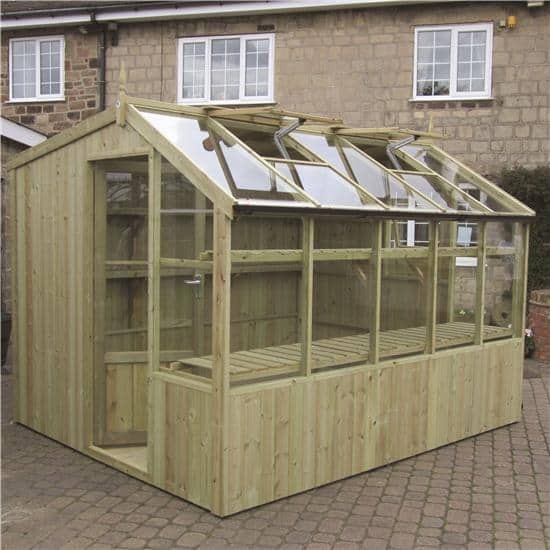 An important thing to note is that companies providing assembly and installation services will usually ask you to have a base already set in place for your potting shed. 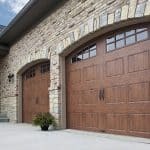 You can use paving slabs, solid concrete bases, or concrete strip footing for this application. Always remember that the goal of a base is twofold – provide a way for the weight of the shed to be transferred evenly onto the ground, and prevent water from accumulating under your structure. If you want to learn more, we have a guide on how to lay a shed base. Deciding with potting shed to buy requires a bit of planning, but every extra second of effort you take will certainly translate into a prolonged lifespan, allowing you to enjoy your hobby to its fullest.